Dr. Jean Layton-Gluten Free Doctor: Chorizo Sausage and Peppers Stuffed Enchiladas with Easy Corn Tortillas. Chorizo Sausage and Peppers Stuffed Enchiladas with Easy Corn Tortillas. A dear friend sent me a request to take a look at a new book, Enchiladas: Aztec to Tex Mex . She knows I love spicy foods, knows I love new techniques and knows I like to support other writers. Put all this together and you get me cooking homemade tortillas at 9pm after a long day at the office. They are not hard to make at all. So simple, I got into the groove and made 16 in about 15 minutes. I browned slivered onions, poblano peppers, red peppers and pork sausage as a quick filling . The food processor took care of the enchilada sauce, and a bit of queso fresco finished the dish with a mild creamy flavor. White Wings Corn Tortilla mix (Harina para Preparada Tortillas de Maíz), which is manufactured by C.H. Guenther & Son, Inc. at Pioneer Mills in San Antonio, is our preferred brand of dried masa to use for making tortillas. Maseca Instant Corn Masa is also good and is widely available at many Mexican specialty stores and supermarkets nationwide. (If buying Maseca, be sure to buy the package that is labeled “Masa Instantánea de Maíz,” which means “instant corn masa flour,” not “para hacer tamales,” which is intended for use in making tamales.) If buying another brand of dried masa, make sure the label reads “de maíz,” which means corn. Fresh masa is corn that has been nixtamalized and ground while still moist. It is packaged in plastic bags and sold by weight. * Heat a well-seasoned comal or iron griddle over medium-high heat. If possible, set the comal at two temperatures: 325°F (163°C) and 375°F (191°C). The cooler side is for the first two turns of the tortilla. For the last turn of the tortilla, move it to the 375°F (191°C) side. This helps encourage puffing. Some chefs lay a tortilla directly on a burner flame for the last turn. water while stirring. Knead dough until it comes together. Add a little more water, 1 tablespoon (15 ml) at a time, or sprinkle on a little additional dried masa as needed to form a smooth, soft, moist dough (amount will vary depending on humidity and dryness of masa). Season with (optional) salt to taste. Let the dough rest for at least 30 minutes (to fully hydrate the dough), or refrigerate for several hours or overnight. If it has been refrigerated, allow the dough to sit at room temperature for about 1 hour before proceeding. * Divide dough into 16 balls (see note) and cover with plastic wrap or a damp towel to prevent the dough from drying out (this is very important). * Place a round of plastic on the tortilla press, and place a ball of masa on top of the plastic just slightly off center toward the hinge (this helps maintain an even thickness). * Place a second piece of plastic over the ball of masa, flatten it slightly by hand, then close the lid and press. * Some chefs like to turn the package 180 degrees and gently press again. * Transfer the exposed side of tortilla to the opposite hand. Fingers should be close together and the tortilla should be placed on the fingertips, not the palm. Peel off the remaining sheet of plastic. * Keeping palm up and nearly flat, gently lay the tortilla on the cooler side of the comal or iron griddle. Try to prevent the tortilla from folding over on itself when placing it on the comal. Cook for about 30 seconds, or until edges begin to firm. * Using a thin spatula, turn tortilla. Cook for about 1 minute more; the underside should begin to develop little blisters and slight freckles of brown. * Turn the tortilla over onto the hotter side of the comal, and after a few seconds, if the dough was the right consistency and the comal set to the right heat, the tortilla should puff up (if it doesn’t, it is still perfectly usable). Continue cooking until the underside has some brown spots and the tortilla is cooked through. * Place in a cloth-lined basket and keep covered while pressing and cooking the remaining tortillas. Notes: It is a good idea to do a test with the first tortilla before dividing dough into balls. The tortilla should be of even thickness—not so thin that it will tear apart when removed from the plastic, and not so thick that it will be difficult to fold or roll after it is cooked. The edge should be smooth, not crumbly. If it is crumbly, work a little more water into the dough. The dough should leave a little residue when pressed against the palm. Resist the temptation to wash off the thin film of dried masa that builds up on palms while transferring the tortillas to the comal. It actually helps keep the tortillas from sticking to hands. 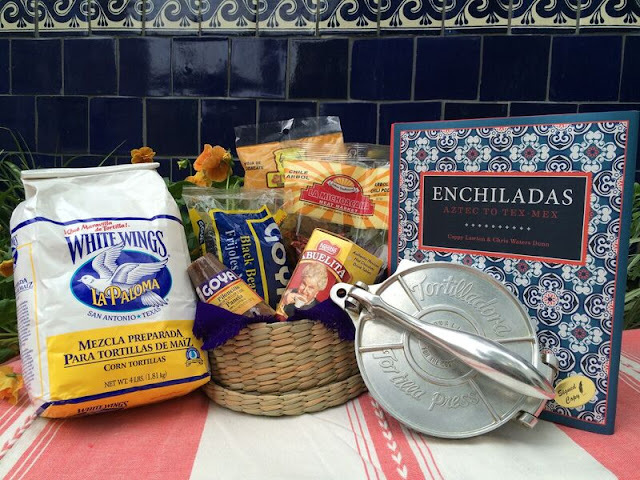 The authors are running a Rafflecopter giveaway, ready to gift one special reader the perfect holiday gift- White Wings tortilla flour, a tortilla press and lots of ingredients for the wonderful recipes inside Enchiladas: Aztec to Tex Mex . Leave a comment to enter and click through the link above to let them know you want to win.